Let’s face it - everybody needs a unique place to call their own, even young ones with little spaces. Between bedtime, naptime, and play time, our kids spend a large chunk of time in their rooms. It is important that these spaces convey a feeling of comfort and safety yet encourage fun and imaginative play. Here are some things to keep in mind when it is time to transform your child’s room into their very own magical oasis! As all parents know, this is a tough task. But it is important to stay on top of clutter before it gets out of hand. Keep an eye on your child’s toys, and clear out anything your child hasn’t played with for a few months. You can rotate the toys every couple months, keeping them “fresh” in your child’s mind, or if they have outgrown the toys, it’s time for storage (if they can be used in the future… siblings, etc.) or donation. This may be hard to do, but trust me, it’s for the best! Plus, this is the perfect time of year for donations to those less fortunate and it makes room for new age-appropriate toys, with which your kids are sure to fall in love. 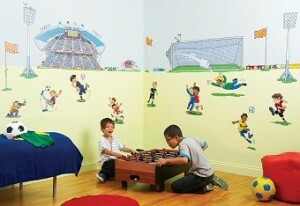 There’s no better place to display your kids’ artistic creativity and honored achievements than in their very own space! A magnetic board with quirky magnets is the perfect way to display special artwork and photos, and designating a specific shelf for trophies and other special treasures keeps them neatly organized while remaining on display for all to see. Color Feng Shui for kids indicates that while bright colors are great for playrooms as they are energizing, more subdued colors are better for bedrooms, promoting calmness and rest. Pastels are best, but don’t worry about pastels being too girlie for young lads… light greens and light blues are the colors of nature and perfect for room themes with grass and sky tones. Get into the decorating groove by selecting the perfect theme for your child’s room. There are so many creative options to from which to choose… favorite characters to imaginative themes to splashes of color and pattern! Wall decals provide quick and inexpensive makeovers! Kids go through so many phases and favorites as they grow… pretty princesses and ponies, superhero and camouflage, retro and groovy, dinosaurs and puppies… they seem to have a new favorite every year. Well, not to worry! Peel and stick wall decals come in a huge variety of themes, are quick and easy to use, and best of all, they are an inexpensive way to completely transform the walls of your kids’ rooms. Bringing your kids’ favorite characters right to their walls and decorating their rooms in fun and fanciful ways infuses color, personality, and imagination, creating their own special space in your home. Get personal with fabric wall art. No matter what theme you choose, kids love things with their names on them and with 50+ colors to choose from, our personalized fabric art can be made to compliment any room décor. Whether you spell out your child’s name in fabric letters, balloons, or blocks or have his or her name added to a castle, dump truck, or rainbow, fabric wall art adds a personalized, 3-dimensional splash to any theme.